I need help in creating libs in Android Studio for my project, mine are not auto generated. When I want to create a folder, it gives me lots of options, like AIDL, Assets, JNI, Java, Java Resources, Renderscripts and Res folders. I chose Res and added a libs folder but it didn't show up on my file structure on the left. I wanted to add a JAR file but I can't find libs to put in. The solution for me was very simple (after 10 hours of searching). Above where your folders are there is a combobox that says "android" click it and choose "Project". 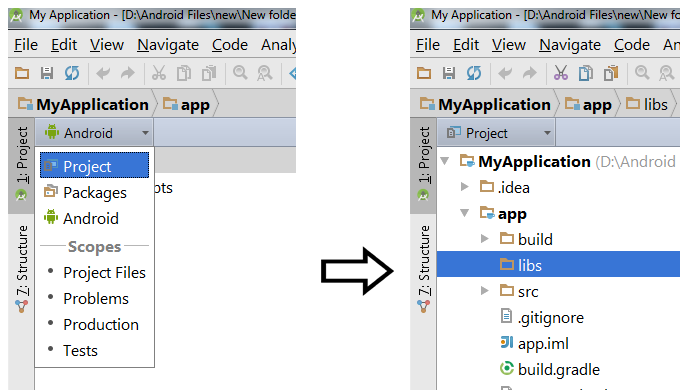 Create libs folder inside app folder and Asset folder inside main in the project directory by exploring project directory. Another strange thing. You wont see the libs folder in Android Studio, unless you have at least 1 file in the folder. So, I had to go to the libs folder using File Explorer, and then place the jar file there. Then, it showed up in Android Studio. also, to get the right arrow, right click and "Add as Library". Not the answer you're looking for? Browse other questions tagged android android-studio folder libs or ask your own question. Trying to add files to my External Libraries folder in Android Studio 1.4 Beta 2 to no avail.